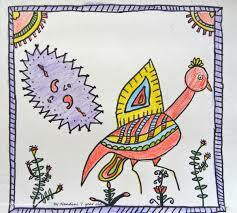 Madhubani paintings is an India folk art painting of the small town Madhubani. 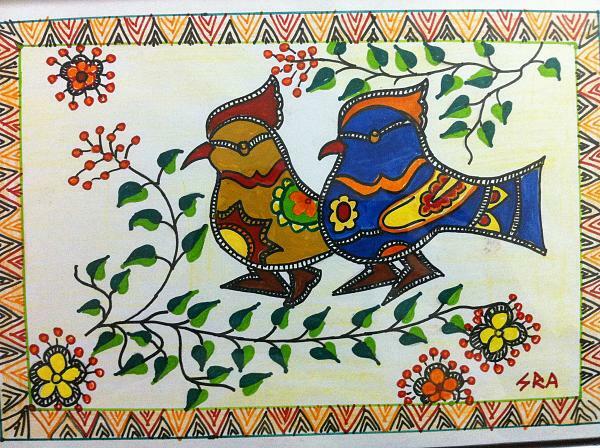 This painting is painted by women of Madhubani. 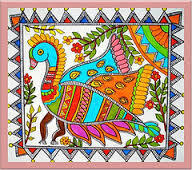 Madhubani painting is related to the culture of this region and is performen in almost all holy occassion. 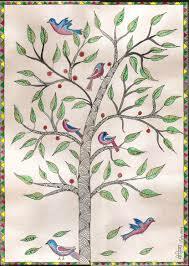 As this painting is related to the culture and cultural activities of Mithila, this art is also known as Mithila painting. In early days this painting was painted using natural resources including paper and colours. But, now it is painted using painting clothe and oil paints. Here I will give you some simple design which will help you to make Madhubani paintings in simple steps. Step 1: Take a piece of paper or clothe. Step 2: Design border and outline using some regular pattern. You can use various colour to make it attractive. Step3: Draw any simple design in the middle of paper. You can draw fish or peacock or any other design using pencil. Step 4: Now color this painting using oil colour and brush.